Gaetano Veneziano (1665-1715) trained in Naples and taught for most of his life at the city’s Conservatorio di S Maria di Loreto. Most of his music seems to be lost but recently four hitherto unknown oratorios turned up in the composer’s own manuscript, now in the library of Brussels Conservatoire; the first of these is La Santissima Trinità (1693). It is a singleact allegory in which God the Father (Omnipotence), the Son (Divine Love) and the Holy Spirit (Wisdom) defend the Blessed Virgin against Sin (the bass, who represents Satan). Sapienza’s ‘Quanto so, voglio crearla’ (sung ardently by Filippo Mineccia) and the Virgin Mary’s ‘Il più bello, il più nobile oggetto’ (sung with chaste purity by Leslie Visco) reveal an attractive and concise aria style that bears close comparison to Alessandro Scarlatti. The Blessed Virgin’s longer aria ‘Il tuo stral divino arciero’ features an obbligato violin, played compassionately by Alessandro Ciccolini. Cristina Grifone’s Divine Love sometimes sings a little harshly and sharp, and I would like to hear a more mellifluous tenor than the nasal Rosario Totaro singing Onnipotenza’s benign expressions of wisdom, but the arrival of Giuseppe Naviglio’s menacing Sin gives proceedings a dramatic shot in the arm, and all five singers declaim their texts with crystalline clarity. 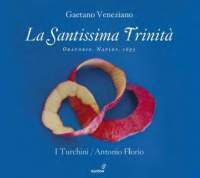 As befits their years of experience in his repertoire, Antonio Florio and I Turchini present valuable evidence of the musical merits of a neglected generation of Italian composers.